>>"......No.It'll be useless even if I say it." >>"You didn't do it on purpose, did you!?" >> "I-It wasn't on purpose?" >>"Why must I do such a thing....!?" >>".....I understand. Give it to me." >>"Don't say such a thing so lightly." >>"It's weird no matter how I think about it!" Please help me for the White Day scene. I can't seem to find the last one. The white day scene is found in the menu~ But you have to get all the other endings before it appears. http://www.englishotomegames.net/post/18103054051/boku-no-shokora-release-dates-windows <--- did you change your locale language? Hmmmm weird~ I redownloaded it and it works fine. Hmmmm make sure that the locale (not location) is japan. And you must restart your computer. Then start the game. Hi if you want the game itself you could go to fuwanovel. They pretty much have any otome there with th English patch already built into the game you just need to download. 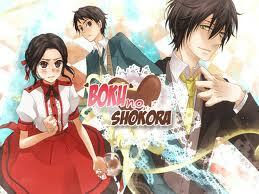 If you go to the otome tab boku no shokora should be there. So when you click on it, on its page click the on that says "Download" in a green box if you scroll down the page. Just follow the instructions, if there are any. But for me I just downloaded the game and as sson as I clicked the application it worked. BTW make sure you have some sort of torrent app like bittorent, the one I use is Vuze for the game cause after you download it from the site, the game has the go through torrent which doesn't normally take long. Good luck and happy gaming>! can you giving the walkthrough for white days scenario? The white day scene can be found in the menu. Hello! Thanks for the walkthrough! Can you please tell me how to reach 3rd Ending in White Day Scenario? For white day scene, how to get the first ending ? I got the rest but unfortunately not the first one. Pls help. Thank you !